Kids Hurt After Bounce House Soars High In The Air : The Two-Way Two children were seriously hurt in upstate New York after the inflatable playhouse they were in was sent high into the air by a strong gust of wind. 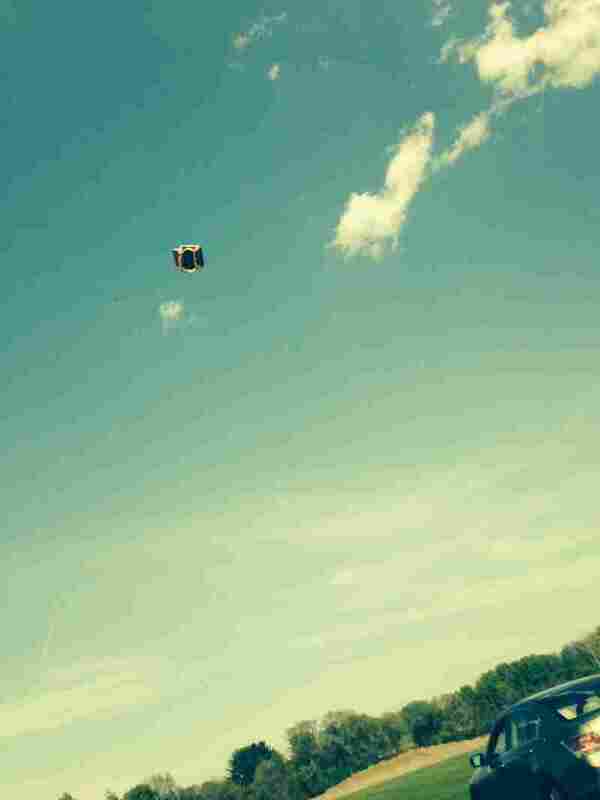 An eyewitness photo shows an inflatable playhouse being blown high in the air. Two boys were seriously injured when they fell out at 15 feet, and a girl who fell out at a lower height also was hurt. Proceeds from the licensing of this image are being donated to the kids' families. Two kindergartners were seriously hurt after the "bounce house" they were playing in was sent high into the air by a strong gust of wind Monday in upstate New York. Both children needed to be hospitalized after falling out of the inflatable playhouse. The boys, ages 5 and 6, fell to the street from at least 15 feet in the air, according to the Post-Star of South Glens Falls, N.Y., north of Albany. A girl, 10, who also had been in the playhouse was hurt when she fell out at a lower height. The inflatable play set had been set up in the yard of an apartment complex but was carried off after a strong wind pulled its stakes out of the ground, the Post-Star reports. Resident Taylor Seymour tells the newspaper that the small house looked like it was caught in a small tornado. "It was like a horror movie," she said. "It just kept going up and up. It cleared our building and the trees." One boy struck a car in the apartment building's parking lot as he fell, suffering a serious head injury; the other fell to the pavement on a nearby street, breaking both arms and his jaw, according to an update from the newspaper Wednesday morning. Both boys are now said to be in stable condition. The play set was reportedly a Little Tikes inflatable house, measuring about 10 feet on each side. The newspaper says a resident of the apartment building had set it up for kids to play in several times before. "It's just a tragic accident," Police Chief Kevin Judd told the Post-Star on Wednesday. As scary as the incident was, it could have been even worse: A photo from the scene captured the shocking sight of the empty bounce house soaring more than 50 feet in the sky after the children had fallen out. It eventually landed at a middle school about three blocks away from the lawn where the kids had been playing. "South Glens Falls student Emily Boucher, who was preparing for a lacrosse game at the Middle School, took a shocking picture of the toy as it flew through the air. The Bouchers gave The Post-Star exclusive rights to use the photo, and proceeds of its sale to other media outlets will be donated by the Bouchers to the families of the boys who were hurt." The Post-Star's Don Lehman tells WBUR's Here & Now that the weather Monday was unusual for the area for this time of year — in the upper 80s, with high wind gusts. "We did get a call from another meteorologist who said he thinks it was something called a dust devil, which is like a mini-tornado," Lehman says. "But the Weather Service in Albany kind of discounted that, saying they didn't really see any evidence of that." Lehman says the weather service's reporting station is about 5 miles from the lawn where the house floated away.